King Solomon presided over a golden age of peace and prosperity in ancient Israel. During this time Solomon instituted an unprecedented building program. As one of Solomon’s chief governors, you must procure materials and oversee construction of buildings and roads across the land for the glory of Solomon. You will also help to construct the Temple, one of the wonders of the ancient world. There were some vague aspects to the game play – a few actions not very clear in the rule booklet. Minion offers a revised set of rules (download the PDF) that helps clear those up. They also offer an “upgrade kit” that replaces some of the wee wooden bits with Monopoly-style buildings (a good choice). I might invest in that, because I think this one will get to the table again. Our local game group liked it a lot, and we all give it a green light. The theme is fairly well integrated – all the effects make sense and resources are limited in such a way that their value seems more realistic. I recommend this as a “just inside the gateway” game… a bit much for the mass-market crowd to handle, but after a few rounds of King of Tokyo, when the room gets quieter again, this might work. 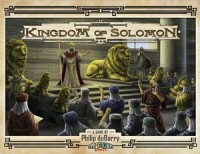 Add a Review for "Kingdom of Solomon"